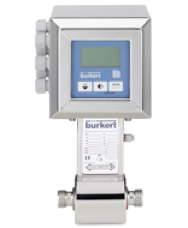 Tubular sight glass – This is where the sight glass acts as a transparent tube through which the operator of a tank or boiler can observe the level of liquid contained within. Circular sight glass – A circular pane of glass through which an operator can view inside a vessel. Sight flow – An in-line style sight glass which allows the flow of a fluid in a pipeline to be observed. This Inoxpa 8000 tubular sight glass has a stainless-steel frame and a pipe made of glass for easy inspection of the product flow. Including a full-bore design, self-locking nuts and 360 degree viewing angle, this tubular sight glass is great for applications in the food and beverage, cosmetics and pharmaceutical industries. The Valsteam ADCA double window sight glass DW40S has been designed for monitoring the right operation of a steam trap, to avoid leakage of live steam and consequently big energy losses. 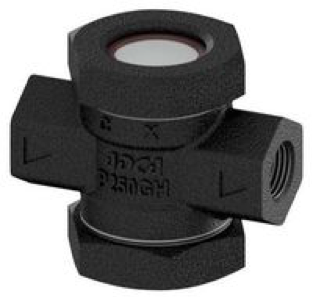 It is recommended that this sight glass is installed downstream of the steam trap. 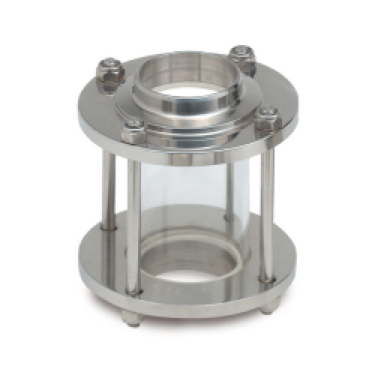 This double window DW sight glass has been designed for this particular application with connections being either female screwed or flanged. For more information on the full range of sight glasses we supply call 0141 762 0657 or contact us via email on sales@bmengineering.co.uk. What is a sight glass? A sight glass, also known as a sight window or sight port, is a robust cylindrical window that allows convenient and/or safe visual observation of the interior of a tank or pipe that usually contains fluid. What are some common sight glass applications? Sight glasses are versatile and can usually be seen in an array of common applications. Most coffee makers or espresso machines have some kind of fluid level gauge. Whereas, motorcycle engines have sight glasses to allow visual inspection of oil levels. In regards to industrial sight glasses, they are regularly found in processes or plants where liquid flow inspection and control is vital.